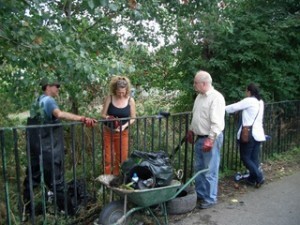 For the first time in at least a couple of years, this month’s cleanup brought us back to the river at Kimber Road in Wandsworth: a very public part of the Wandle Trail, where the Wandle is tightly canalised between King George’s Park and private gardens backing onto the river. 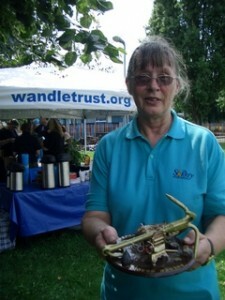 At coffee time we applauded the recipient of our famous Golden Grapple, the Wandle Trust’s award for the volunteer who’s gone furthest beyond the call of duty to help our aims and objectives this year. 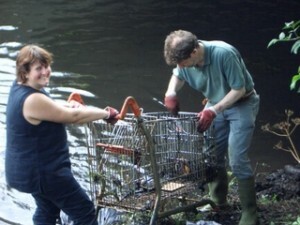 … having met us for the first time when she was Lady Mayoress of Sutton (unhesitatingly climbing into waders, mayoral chain and all, to help us grapple rubbish out of Beddington Park Lake), she’s now a regular cleanup volunteer, gravel washer and egg delivery co-pilot for our Trout in the Classroom programme. 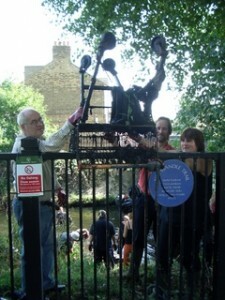 A true Wandle trouper if ever there was one! 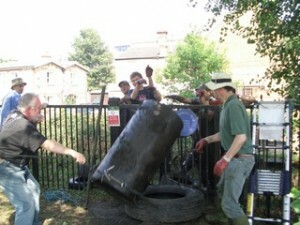 … before gratefully retiring to the Old Sergeant on Garrett Lane for a rehydrating pint or three! 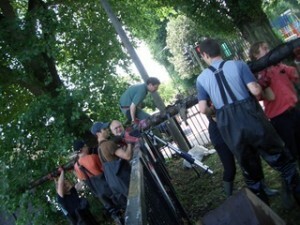 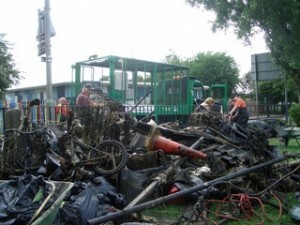 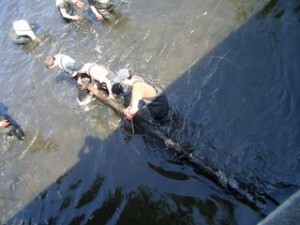 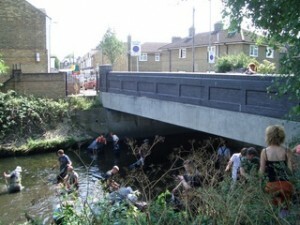 This entry was posted in Uncategorized and tagged Awards, Cleanups, Events, Wandle on August 18, 2009 by Theo. 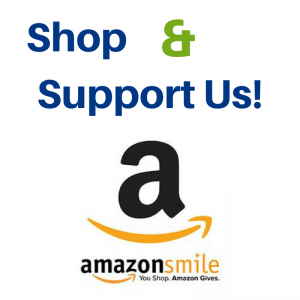 John, sorry for the delay in getting back to you – currently we’re having to unapprove / delete 25+ spam comments per day, trying to sell us stuff we never knew we wanted – so sometimes a day or so goes by without facing the torrent!